We offer cold saw operations for our customers. Our semi-automatic cold saws offer precision cuts with little to no burr. 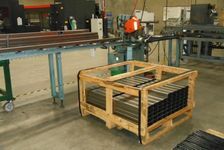 In addition to sawing we also incorporate small cell manufacturing with our saws. We can cut, deburr, punch, notch, drill, tap, machine, form and more, in any combination with our saws. This gives us the ability to provide more value added operations for your money.